Home » upper lip tie » Does Upper Lip Tie Removal Help Prevent Upper Front Teeth Gap? 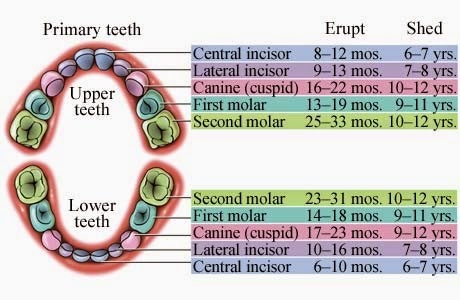 It is not uncommon that I see a newborn or young child for upper lip tie with a specific parental concern for development (or existence) of a gap between the two upper front teeth. Also known as maxillary midline diastema, this condition is extremely common being present in up to 50%+ of children between ages 6 and 8. It should be mentioned that upper lip tie frenulectomy (or frenectomy) is the complete removal of the upper lip tie surgically which is different from upper lip tie release that is performed to address breastfeeding difficulty and does not involve any tissue removal. When it comes to upper front teeth gap or diastema, frenulectomy is the procedure under consideration (not the release). However, given it is unclear what role upper lip tie has in the development of diastema it also brings into question what role frenulectomy has in preventing or addressing diastema. It's because this gap in the vast majority of children spontaneously resolves without any intervention by the age of 15 (only 5% have a persistent gap by this age). If you recall, 50%+ start out with a gap. Typically, there is a dramatic resolution of diastema between the ages of 9 and 11 years of age when the adult incisors and canines come in. Furthermore, no correlation has been found between frenulum attachment site and diastema width, between frenulum thickness and diastema, or between frenulum height and frenulum width [study link]. Enlarged and low frenulum DO exist in the absence of diastema. When upper lip tie IS removed, it seems to have only a minimal influence on diastema resolution. In one study, only 2 patients out of 27 had closure after frenulectomy alone. A much higher success rate was achieved with frenulectomy and orthodontics together. What would have been even more interesting (which was not done) is if the study included a group of patients who had orthodontics alone without frenulectomy. In another study comparing children that had both upper lip tie and diastema, NO difference was ultimately found in diastema closure when comparing one group that had frenulectomy with another group that did not. That's not to say that upper lip tie does not ever contribute to diastema (it can), but that there are many other reasons why this gap occurs. Diastema may actually be a normal and temporary stage during dental development. The diastema naturally resolves as the adult lateral incisor and canine roots constrain the roots of the front upper teeth causing any gap to resolve spontaneously. 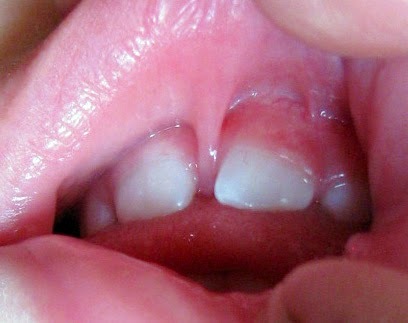 The frenulum itself recedes further under the lip as the maxilla increases in vertical height. Outward pressure exerted on the upper teeth by bad oral habit may lead to diastema over time if left untreated. Such bad habits include thumb-sucking and biting the lower lip. Muscular imbalances, abnormal maxillary arch, dental anomalies, and malocclusions may also lead to diastema. Because there are numerous reasons why diastema may occur, even textbooks specializing in pediatric dentistry do not recommend frenulectomy in young children (or younger) to address diastema until around age 11 AFTER the adult canines have come in. Unfortunately, if one google searches upper lip tie and upper front teeth gaps, all the aforementioned factors are ignored or glossed over giving the appearance that there is a uniform recommendation for frenulectomy as the standard intervention in order to prevent this condition... and it should be done using a laser. The laser is a wonderful tool and if frenulectomy is medically warranted, than it should be performed with a laser or another appropriate tool such as scissor, scalpel, or cautery (even our office uses the laser). For example, large upper lip ties may be resected due to concern with teeth decay of the upper front teeth where food debris may collect. Also, such upper lip ties may cause difficulty with toothbrushing in young children due to discomfort with bristle abrasion against the large upper lip tie or constant bumping of the toothbrush head getting caught against the upper lip tie. But again, the mere presence of a large upper lip tie does not necessarily mean cavities will definitely happen. It is still worthwhile to discuss with your pediatric dentist whether this is a significant concern or not. In any case, the problem with laser is that there is a bias towards intervention for practices who own one. Lasers are expensive to purchase and maintain. As such, there is a (subconscious?) financial incentive to use it as much as possible even if unnecessary. Think about it... If frenulectomy is performed in newborns or toddlers due to concern for developing or having diastema, the procedure will be considered a success in the majority of cases. Problem with this statement is that diastema would have resolved in the vast majority of cases even if frenulectomy was NOT performed because that is what would have happened normally with time alone. I should also add that there's also the risk of scar formation that may develop after frenulectomy that may actually be thicker and tougher than the upper lip tie itself which could theoretically increase risk of diastema. At least for me, if upper lip tie frenulectomy is considered to address diastema concerns, I typically require the child to undergo a pediatric dental consultation with an office that does not own a laser in order to obtain as unbiased evaluation as possible. If and only if pediatric dental evaluation recommends frenulectomy do I perform one. On a historical note, in the early 1900s, upper lip frenulectomies were commonly performed to prevent diastema on the belief that upper lip ties were the sole cause of diastema. This surgery went out of favor by the mid-1900s when the upper lip tie was felt to contribute minimally if at all to diastema. It has only been in the last decade that there has been a resurgence of frenulectomies using the same outdated argument used in the early 1900s; that upper lip tie causes diastema. I blame this resurgence squarely on the use of lasers in dental offices and aggressive marketing of this "high-tech" treatment. The midline diastema: a review of its etiology and treatment. Pediatr Dent. 1995 May-Jun;17(3):171-9. Management of maxillary midline diastema with emphasis on etiology. J Clin Pediatr Dent. 2008 Summer;32(4):265-72. The labial frenum, midline diastema, and palatine papilla: a clinical analysis. Dent Clin North Am. 1966 Mar:175-84. This is so very helpful. Thank you for taking the time to write this. I was looking for a site that seemed to have a fair treatment of the issue to see if I should consider getting my (now 7-month-old) son's lip tie "taken care of" and am so glad I found this. Also, a helpful tip about finding a practice that doesn't own a laser to get an assessment done. Seems a good approach to many other things as well! Much obliged.